In the long run, prescribed burning will do more to improve habitat for deer and numerous other wildlife than any other practice. 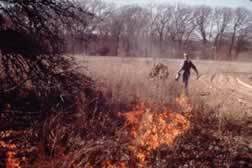 Prescribed burning is also considered the "cheapest, most effective habitat management technique for the Post Oak Savannah region". As a general rule, about 20 percent of upland woodland sites should be prescribed burned during late November (after frost and leaf drop) through February (before green-up) on a rotational basis, burning each site every 5-6 years to remove old growth and stimulate new growth of browse and forbs (weeds and wildflowers). In order to have enough low level fuel to produce a hot fire, one or two years of cattle exclusion from wooded tracts may be necessary to allow growth of vegetation normally grazed by cattle. The best time to carry a fire through woodlands is shortly after leaf drop (while the leaves are still fluffed up with air space and before winter rains and time compact the litter). However, many landowners choose not to burn until the end of deer season. A postponement until mid January to March also allows wildlife to "clean-up" fallen acorns and other mast. About one-third of native grass openings should be prescribe burned each year, burning each site every three years, on a rotating basis. This will remove accumulated dead grass litter and control young, invasive woody species such as cedar, locust, and persimmon. Burning may also stimulate new growth of plants that may have become dormant due to the absence of fire. Pasture burn sites should be burned in late summer (late August through September), or ealy spring (March through April) for best results. Typically, burning during late summer will be more effective in controlling invading woody species, if that is a primary reason for burning. Additionally, research has shown that about seven times more insects are usually found in burned native grass areas compared to unburned areas, thus providing much more spring and summer high protein food for quail and turkey, especially for the young. 1. Prepare disked bare-ground fire guard around all sites before burning. Disked fire guards, which can include roads and right-of-ways, should be 15 to 20 feet wide (These disked areas can be planted to winter supplemental food plots between burn years). 2. Humidity should be between 25 - 40 percent. 3. Wind speed should be between 10 - 15 miles per hour. 4. Always burn into the wind first (backfire) 50 yards into the woods or pasture then set fire with the wind (headfire). 5. Initiate burns in the morning after 9 a.m. Consult with TPWD, NRCS, or Texas Forest Service and notify local volunteer fire department before conducting burns. Cattle should be excluded from burned areas for at least 3 months to allow regrowth of new tender vegetation. For specific information about Leopold's 5 tools as the Apply to the Post Oak Savannah and Blackland Prairie, please click on the appropriate category below.